I decided to try making a process video, so I filmed making this layout from start to finish. I made it over the course of several days, working on other projects in between while I thought about this one and waited for a few minutes of time when I could film without little hands reaching up to help. In the end, I had over 1.5 hours of video, and after I cut out the several minutes of table that I video taped and I sped up the rest, I ended up with 7 minutes of film. I hope you'll watch it. And, I REALLY hope you'll leave comments (here, or by email: ashley.calder@gmail.com) to let me know what you didn't like, what you did like, and what you might like to see in future videos. Thank you so much to the lovely ladies at 2Peas for the encouragement to give this a try! More baby toes! Because they are super cute, and don't stay super cute baby toes for long. I inked the background of this page using a Hero Arts Neon Yellow inkpad. Just applied it directly to the cardstock. It really does create the most awesome day-glo cross-hatching ever. I tried to capture it in these photos, so hopefully you can see what I mean. These letter stickers are very cool gold foil -- Sentiment Thickers. 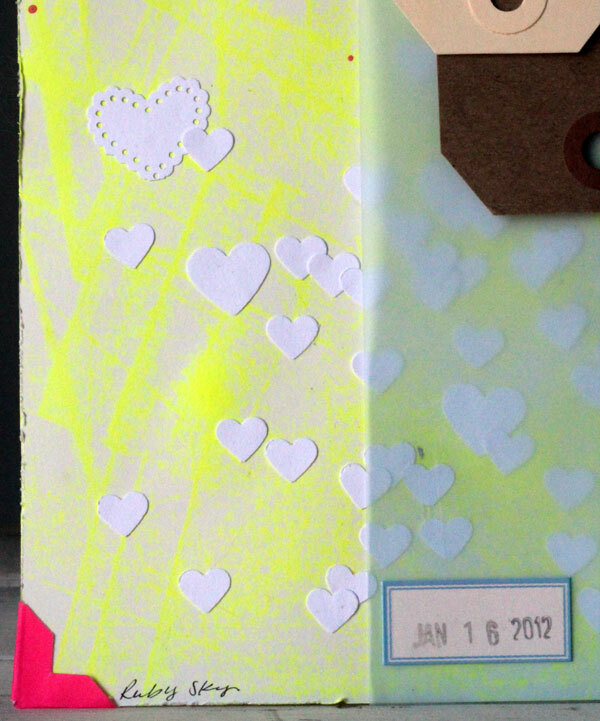 I cut a heart out of some scrap cardstock and covered it in cheap dollar store glitter. I *always* buy glitter whenever I find it inexpensively, because even though I have eleventy thousand gold glitters, THIS one was the only right one for this page. The cloud is cut from an old dictionary. I always feel terribly guilty when I start ripping apart a book, but as soon as that first page is pulled, I am totally over that guilt and move onto addiction. As in, addicted to using book pages. Right now I'm stuck on them and when I'm feeling like, "hmmm.. this page needs something", a book page is usually exactly what it needs. So, here is the video! Supplies: letter stickers (American Crafts Thickers); tags (Ranger, the Paper Company, Avery); ink (Hero Arts Neon Yellow); velum (the Paper Company); punches (Martha Stewart, Recollections); photo corners (Canson); patterned paper (October Afternoon); tape (Love My Tapes); pen (Sakura). So fantastic to be able to see you creating, step by step. Loved it, so generous of you to share. Love it! I am so intrigued by process videos. I especially love when people show things that were considered and not done, etc. like placing the tags in various positions and deciding otherwise. Great job on your first video! Would definitely enjoy more! Great first video! Love step by step and seeing your decision making process. One request...at the end could you show the final completed layout for a few extra seconds. Can't wait to see your next one! I love watching videos of others creations. I learn so much watching the process as oppossed to just seeing the finished product. I see LO's that I think are amazing and think I could never do that but watching the tags appear, move, disappear and reappear shows that even the greats experiment on their pages. 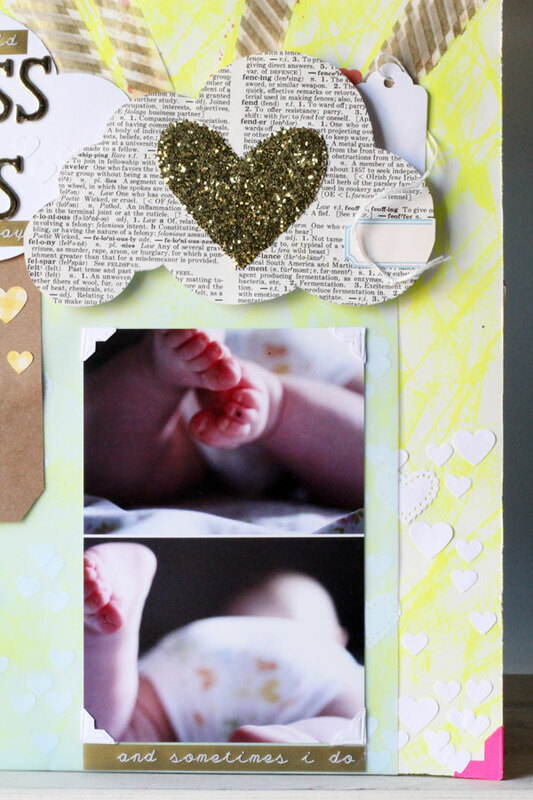 On my next layout I will use confetti and photo corners and see how I can make them work for me! Oh Ashley! this was just awesome to see a process video by you. I hope you keep it coming in the future! The LO turned out really well and it's reassuring to know that someone as experienced as you move things around with indecision as I do, until it looks just right. I've been wanting to do a process video for a while too, but not sure how to attach the camera since I don't have access from the other side of the table (my desk is attached to the hutch). How do you have your camera positioned above? is it on a tripod? Thanks much, and hoping to see more videos of your lovely creations! I really enjoyed watching your tutorial. I love to see other people creations. You did a very beautiful page. Thanks for sharing, Johanne L.
Thank you for the replies! I appreciate it. One request...at the end could you show the final completed layout for a few extra seconds. Great point! Thank you so much! I will definitely show a still shot of the finished project at the end of the video next time. I am so glad you took the time to do this! I enjoyed it, and it was another stunning layout. I would suggest somehow having the camera behind you so the orientation is up for viewers. Otherwise, I think you are a natural!! Thanks for sharing!! Oh Ashley, I loved it! I think you've got it, first time out! I enjoyed listening to your sweet sounding raspy voice, too..you sound so young! Is there anything you can't do well, girl?! I always enjoy your posts on NSBR, you are just ridiculously talented! Thanks for the video, more! More!